I grew up in Pennsylvania Dutch country in an Italian family. This means egg noodles and egg pasta showed up in many meals. The egg pasta recipe and egg noodles recipe is the same, and can be used to make a homemade chicken noodle soup or a pasta with tomato sauce. 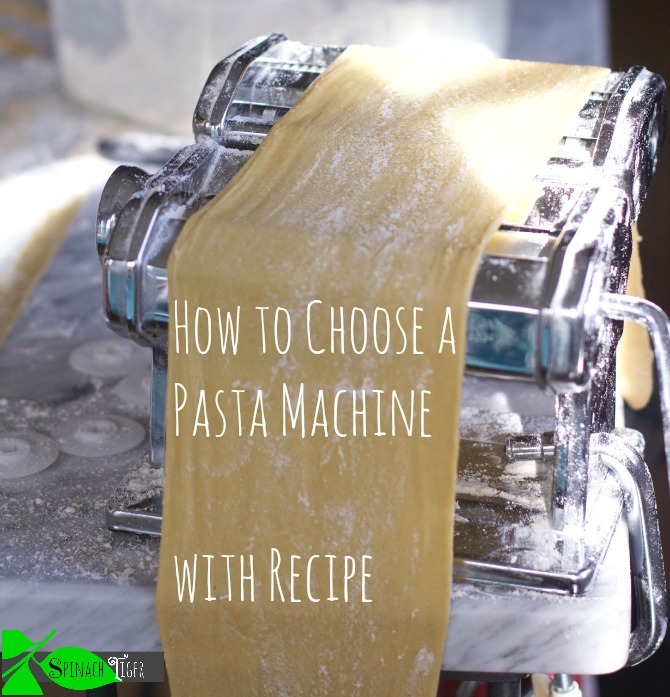 Homemade egg pasta is not hard to do, if you have the right equipment and just a little know how. I taught myself by trial and error and I’m still honing the process. The proof of ease is in the pictures below, as even little boys can learn to make homemade pasta. Long before I bought a Kitchen Aid attachment, I bought the Mercato Atlas when it was around $50. The Mercato Atlas now runs around $75 or under on Amazon, and requires hand cranking. If you have a Kitchen Aid Mixer, you can get the pasta roller attachment, which attaches to the power hub. I also have that, but find myself often just using the hand crank Atlas, because kids love hands-on gadgets. The Kitchen Aid attachment rolls out the pasta in nice long ribbons with a touch of a button. You still have to hand cut it and that’s when the Atlas comes in handy, as it has two sides for two different types of noodles. There are two kinds of pasta cutters, as you can see in the above picture. You can buy one that is a single roller, but I love the pasta bike that allows you to adjust the size and cut ribbons of pasta evenly. I bought mine in Italy, but Amazon has a Mercato Atlas pasta bike, which is also adjustable and will do same thing. By the way, it’s great for cutting pie crust for a lattice top. Everyone has their own idea of how to make an egg pasta. I keep it very simple. Flour, salt, and eggs. I always let it rest on the counter covered for 30 minutes. Then using more flour, but not too much more, I divide and roll into large strips. The pasta will still be wet and not yet ready to cut. This is the tricky part. You MUST wait 10 to 15 minutes to get the pasta dry enough to cut, but not too dry that it will be brittle. Pasta is not like pie dough and if it’s too wet, that’s not a problem. Roll out and start over. Rolling out the right thickness of pasta is a bit of an art. I err on the side of the thinnest I can get it, as pasta will swell in the water. You want some body to your noodles, and it might take a little trial and error to achieve your personal preference. Then using clean flour sacks, dry the cut pasta. Even if you are planning to cook the pasta right away, dry it for twenty to thirty minutes, enough that it will not stick when placed into the boiling water. You can dust your noodles with flour and place them in nests to dry, or hang them on a pasta rack. This one is made by Mercato. If you are not planning on using it right away, dry it, and use it within a couple days or freeze it. You must dry the pasta completely before putting it into plastic bags or it will spoil from the moisture. It might take a few batches to get the process down. 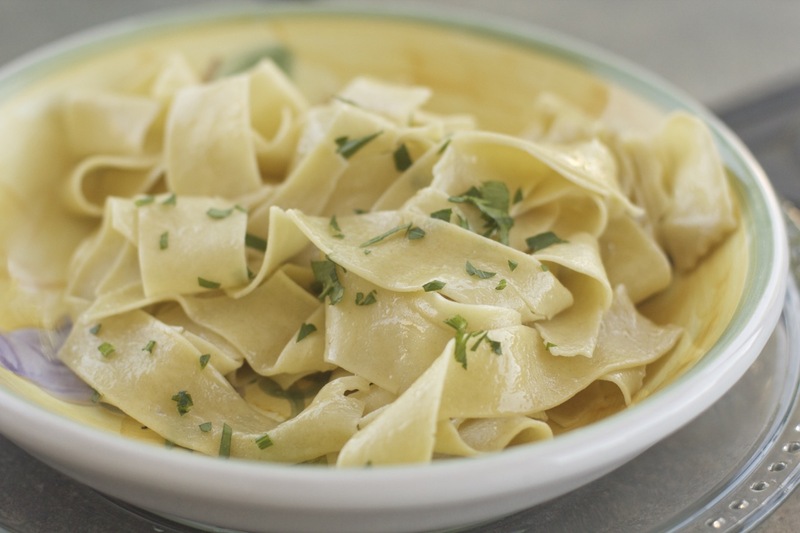 We love homemade noodles in chicken noodle soup or just with butter and parsley. If it’s your first time making homemade noodles, just have fun with it, and know that each batch gets a little better. When I was teaching myself noodle making, I threw the first few batches out, but then once I got it, I got it. When Ryder was five, he learned the art of cranking. 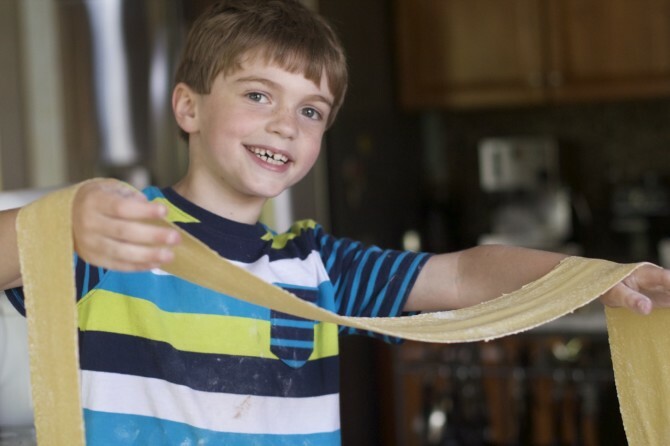 When Ryder was seven, he advanced to making his own sheets of pasta. 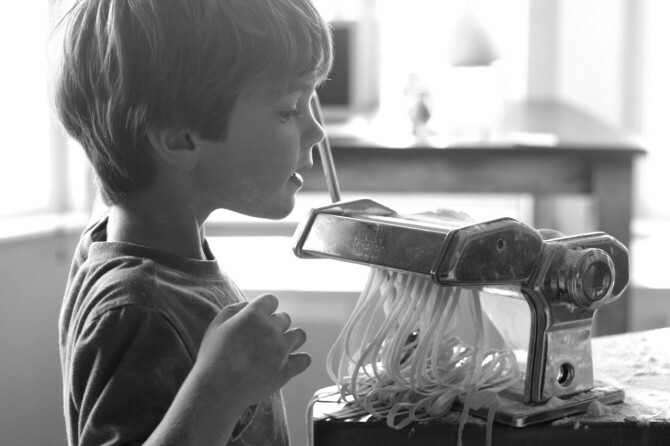 He quickly learned the knack of texture and how to take the pasta through the roller without having a sticky mess. Cooking is a language. The earlier you start, the easier you grasp it. I’d love to hear about your pasta making experiences, and my hope is that you involve children and make it about the journey, which is where and loving memories and true engagement happens. 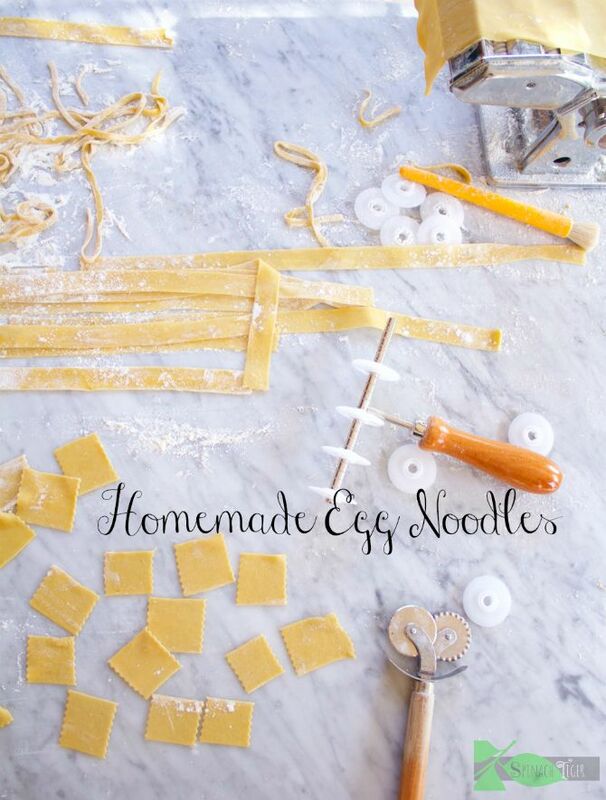 Egg pasta or egg noodles are versatile whether for an Italian dish or old fashioned American comfort food. Place flour on counter. Add in salt. Add the eggs, and mix with a fork one egg at a time. If the pasta appears too dry, add in a little water, just a little at a time. Flour hands and form pasta into a dough by kneading. Wrap in plastic and let rest for 30 minutes. Once rested, roll pasta out, as thin as you can with a rolling pin or take through a pasta roller on in pasta machine as described above. 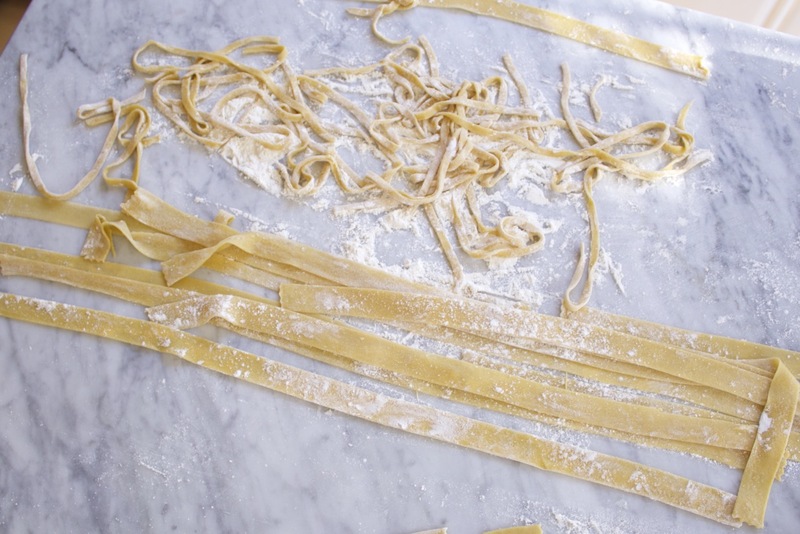 Once you have the pasta strips, allow to sit out on a cloth to dry slightly, up to 20 minutes. You want the pasta hard enough so that it doesn't stick when you cut and soft enough that it doesn't crack or get brittle. 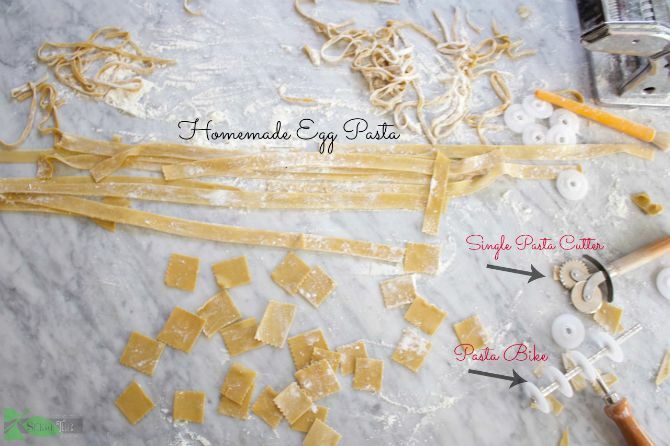 You can use the pasta bike (described above) or hand cut strips in half and roll up and cut in one inch strips. Place in nests on the cloth or on a pasta drying rack. These can dry or you can cook immediately. Fill a large pot with salted, boiling water. Cook about 3 minutes. You can freeze the pasta, but make sure it is completely dried out before placing in plastic bag. Make Pasta: Use plenty of water. The more water, the quicker the pasta cooks. Salt the water right before adding pasta. Homemade noodles cook quickly about 3 minutes. Good info. Makes me want to run home and make a batch of pasta.